I rearranged my wall space at Stars and put out all the beach cottage decor. I brought in my shabby white crates to create shelves for the booth. A couple of shabby blue nightstands tucked in there, and a white wall shelf. A sweet vintage shabby white child’s chair and a little three legged foot stool. Shell topped jars, shell filled jars and shell candle jars. A little round table with a shabby white trug on top. Distressed turquoise frames with ‘floating’ white fingerling starfish. Some BIG sugar starfish, painted white and glittered. A shabby vintage spice rack filled with little jars of shells and sea glass. Some small mermaid crowns and a sugar starfish mounted atop a shabby white candle holder. I did some rearranging and stocking of my big booth too. Lots of stacks of old books, as always. This giant turquoise cubby shelf is filled with vintage milk glass and Ironstone pieces. Some additional, and smaller, cubby shelves. LOVE this vintage chicken tureen! 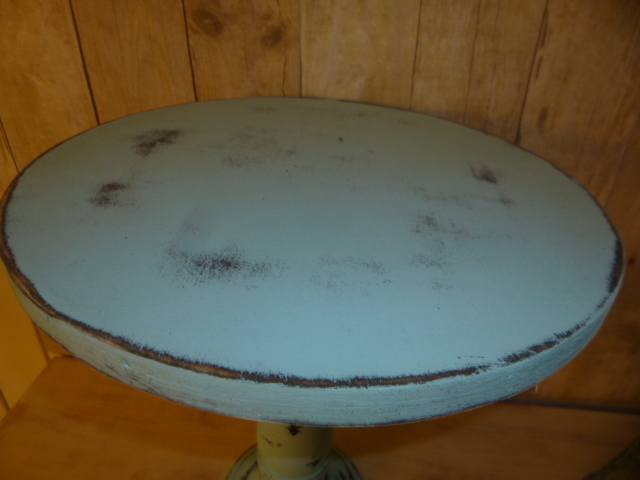 I’ve added lots of this style of vintage Ironstone with the scalloped edges. Beautiful hand painted vintage milk glass vase with gold accents and ruffled edge. Gold glitter Eiffel Tower tags. Little vintage vanity jars. 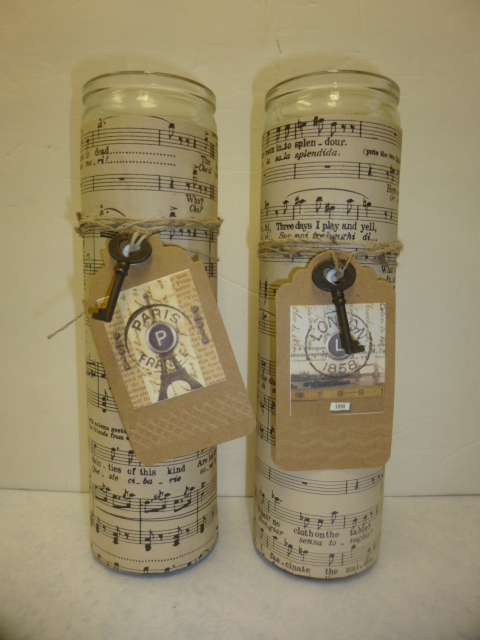 Old bottles and upcycled bottles with repro labels. Vintage metal chair with new gold paint and pretty soft blue and gold Toile covered seat. Come on by and check it all out. The construction on the next block continues; BUT, they have not been blocking off the side street parking as much lately. Went on a bit of a white furniture painting binge recently. Here’s the end result of said binge. Cute little metal birdcage. Just a quick coat of white spray paint. Little brown step stool. Painted white and distressed. Still debating whether or not I should stencil something on it??? 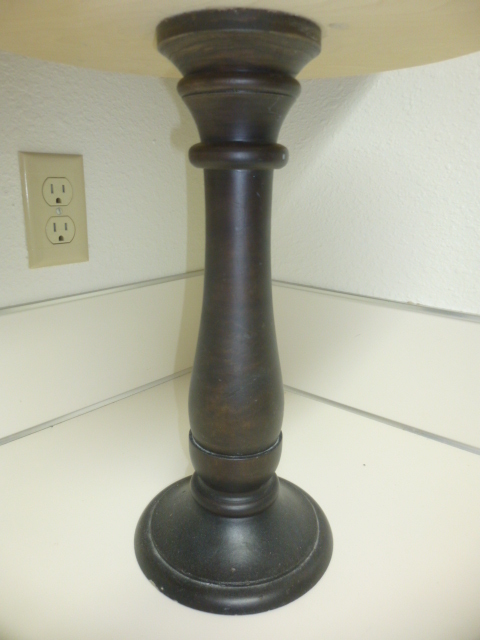 Not a very good picture of the refinished piece on this one. (sorry!) Just a basic white paint job and distressed. Cute three tier wall shelf; again just painted white and distressed. 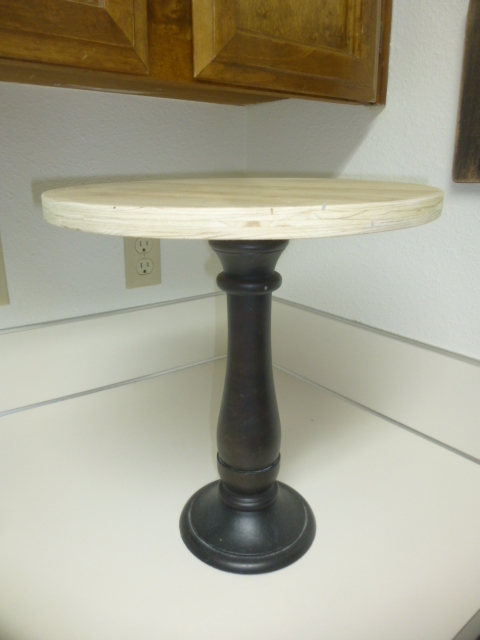 This half round table was the same dark wood color as the shelf above. This little shelf was already white. I just distressed it. This coffee table with lower shelf had already been repainted white, but they didn’t do a very good job of it. You can’t really tell how ‘streaky’ the paint was in the pictures. I needed to sand it before repainting it anyhow; and decided that I liked how it looked without repainting! Distressing covers a multitude of mistakes! Little ‘jewelry box size’ chest. Removed the knobs, sanded off the red, white and blue; painted it white, distressed it and put the repainted knobs back on. easy peasey. Little upcycled side table made using a tall metal candle stand and an inverted metal tray. Glued together using e6000, and spray painted. This ‘open back’ cubby shelf was a medium wood color. The white paint and distressing really emphasized the dental moulding at the top. Below it, in the second photo is another cubby shelf, but with a back. It was already white, so I just distressed it a bit. I guess this shelf was for some kind of sports memorabilia. Some white paint and you have just a regular white wall shelf! No before picture for this one. It was dark brown and had a ‘tapestry-like’ cover on the seat. I LOVE the foot stools that open up like this for storage space! Painted it white and distressed it a little. Added some additional padding to the seat before I recovered it with a pretty soft aqua paisley print fabric. All of these went to my booth at Stars. A few have already sold. So, what’s next??? I’ve got some pretty BIG news! A new shop is opening soon in Aurora . . . and they will be carrying some of my items! Stay tuned for more details and official Grand Opening notice! Got my additional 2’x8′ wall space at Stars all set up yesterday. It’s very difficult to take good pictures because of spatial limitations. There is simply not enough room in that back aisle for me to step back far enough to take a good picture of the entire booth. This is the little sign that I made explaining that there will be an entirely new theme displayed in the space every month. 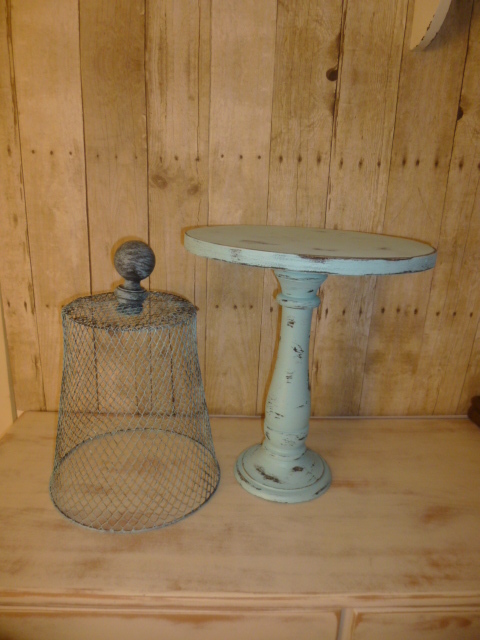 This first display is kind of a mixture of farmhouse, galvanized stuff and garden-ish things. May’s theme will be ‘Happily Ever After’. This picture makes it look even smaller than it actually IS! The purple border on the floor outlines my space; and the shutter door on the right hand side, which I put up to divide my space from the one next to me. The big ladder is not a terribly effective use for this limited space, but it works so well with all the baskets et all. The ladder IS for sale. This is as far back as I can go to take a picture, but you get the idea. This is what all is displayed on the ladder. BIG jar filled with dried hydrangea (from my garden!) on galvanized metal tray. Jar of assorted dried botanicals, another galvanized tray (I have three of them the same size) The metal bird-cage thingys on a pedestal are supposed to be for candles. I put some mini glitter chandeliers in them. Burlap curtains, valance and cafe. I’ve had these curtains forEVER, but have never HUNG them to display them. There are more of the curtains in bundles right beneath the hanging ones. Hand crafted paper wreaths and small olive buckets with pale blue rims. I also have some olive buckets with red rims. Cloche with wood base is filled with three nests. Glass jar is filled with assorted moss and bark, gathered from my yard. I have LOTS more of the nest, egg and botanical items; just no room for them yet. Will be adding more to my big booth after Easter; and as room becomes available in this space. One of the several garden trugs available sitting atop a small grubby step-ladder. Those are big burlap bags in the rusty basket under the ladder. Another trug, vintage canning jars, that third square galvanized tray, a nest with eggs and a bird skeleton; stack of buckets behind the bird. Under the trug is an old rolling mop bucket that I upcycled into a storage bucket with a padded seat. The seat lifts off to store things inside. Big olive bucket and awesome long narrow galvanized trough. Burlap pillow cases in the shabby metal urn to the right. There’s the aforementioned red rimmed olive buckets! A cute little glass and galvanized house and electric grubby candle. Three more garden trugs under all that, and an old tool tray on the right. I’ve got LOTS of these rusty wire mesh baskets. Galvanized storage box with blue lid inside. Stack of buckets, vintage and upcycled. Remember, this ALL GOES AWAY the end of April. LOVE this vintage vanity bench! The existing paint consisted of a very pale aqua/sage green undercoat, topped with pink and topped with a creamy white. The varnish on top of all that paint was very splotchy, drippy and yellowing, so I gave it a good ‘once over’ with the orbital sander . . . .and here it is! This simple little three-legged half-table is super light weight and worked perfectly to stack atop another table to create some height in my booth display. I mostly left it as I found it, and only distressed the top a tad bit more. I actually have THREE of these little three legged stools; and even painted them all white! I only have one stocked in my booth for now though. They look like milking stools, but they don’t have the handle on the side. I thought they would make nice stands for a dessert display. A vintage slat wood picnic basket, and this time I left it ‘as found’ instead of painting it as I’m typically inclined to do with the picnic baskets I procure. I almost passed this one up because it had one of those ugly plastic liners inside. I actually had put it back on the shelf and was ready to walk away, when I decided to take another look and see how difficult it would be to remove the liner. Turns out, the liner was not attached at all and pulled right out! So into my shopping basket it went. One feature of this basket that I especially like is that the lid is hinged about 3/4 of the way on the top. Usually the WHOLE lid is hinged on the outside rim, and those hinges break easily. So I’m thinking this one will be much sturdier and hold up a lot longer. I stacked the newly added unpainted basket with a previously stocked and painted white basket that I stenciled “EAT” to the top of. Little wood stained step stool is kind of ‘fancy’ with a beveled edge. Old apple basket dry brush painted white and filled with apothecary jars. Grubby little step ladder. You can NEVER have too many of these! They are awesome for displaying stuff on, but they usually sell super fast. Most of the time I will just lean them in my booth so the shopper doesn’t have to unload it to buy the ladder. But I was in need of more display space this time, so I loaded it up with Halloween decor. LOTS of vintage milk glass vases. For some reason ‘beach decor’ season totally slipped my mind!! I usually stock the beach stuff right after Easter . . . better late than never, I guess! Vintage white wire garden fencing candle chandelier. 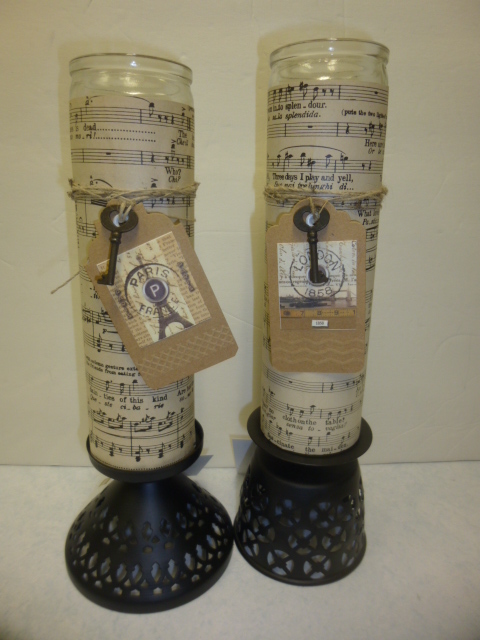 The candle lanterns easily lift off for easy transport. Just add your own battery or regular tea lights. Assorted vintage treasures. Those vintage ‘dirty joke’ cocktail napkins are HILARIOUS! PLEASE don’t let the construction on the block next door scare you away!! Dealers are stocking new items daily, and the parking is NOT as bad as you might be thinking! P.S. Stars sale coming REAL soon!! Here’s my newest batch of prettied up prayer candles. 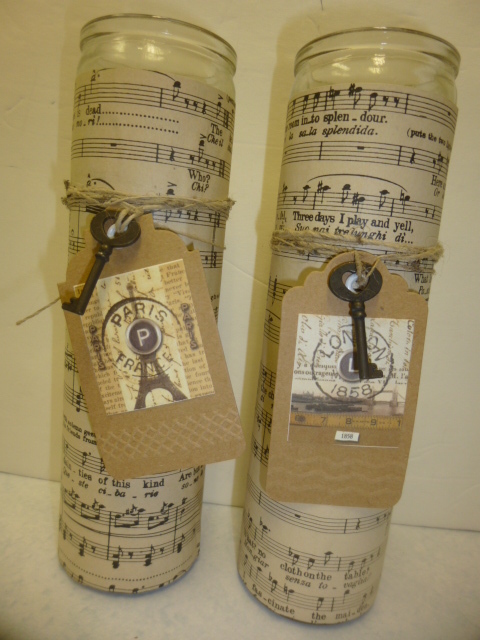 In the past I’ve used vintage sheet music for the background paper. This time I decided on old dictionary pages. There are SO many pretty colors and styles if paper doilies available now. I love this turquoise and kraft combination. The center medallion was punched from some wrapping paper I bought that has assorted vintage looking handwriting on it. I don’t care for the look of the plain white paraffin wax that these are made of, and they always have at least an extra inch of wick. So I top them off with some scented candle was. I tied a couple of reproduction keys around the rim with some turquoise/white bakers twine. You can find prayer candles at just about ANY grocery store, but the plain white ones like this can sometime be more difficult to find. Dollar Tree always has them in stock. My booth at Stars is SOOOOO packed with Christmas stuff right now that I am probably going to set these aside until the first of the year, or maybe spring. I made this altered bottle at the same time as the candles. Just an old glass bottle and some of the wrapping paper glued around it. The ‘padlock’ came from the craft store. As did this key with ‘MEMORY’ stamped into it. 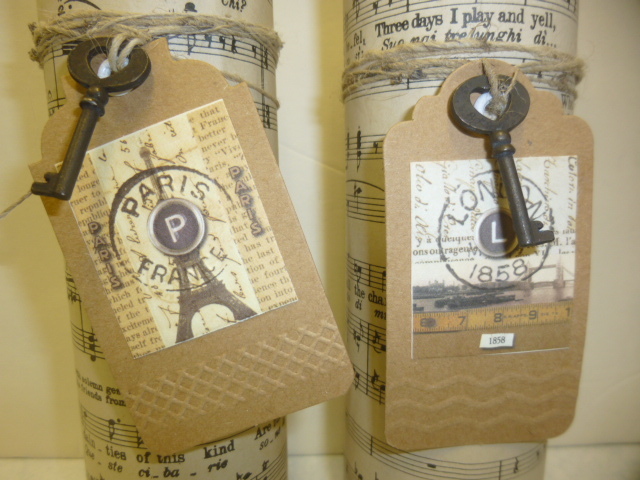 (I think the key was from a Tim Holtz set.) I put a band of tea stained muslin around the neck of the bottle, and tied the key on with bakers twine. I’ll set this one aside too, until I get a whole batch of altered bottles made to take in. Now, back to watching Christmas movies on the Hallmark channel, and ‘resting up’ for craft show delivery and set up. Every Husband’s Nightmare at the Washington County Fairplex; Tuesday – Saturday. 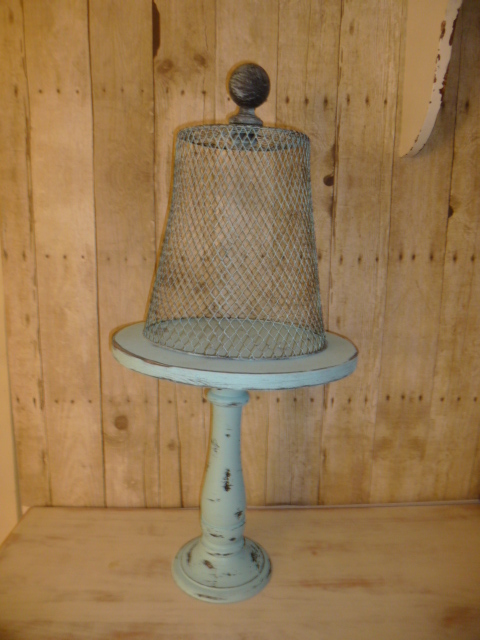 Upcycled wire cloche with pedestal base. 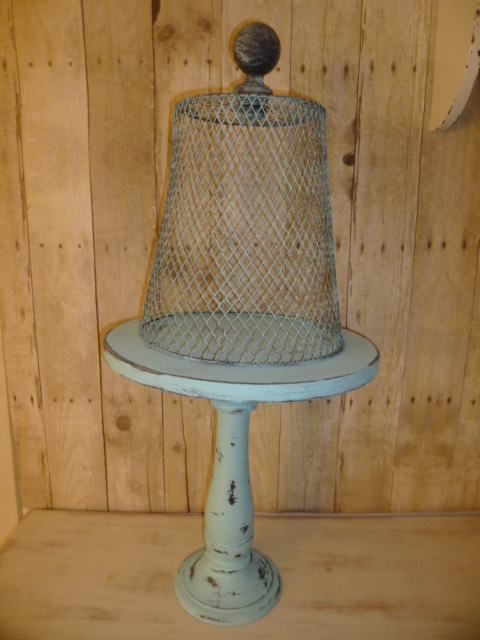 Here’s my latest upcycled wire cloche with pedestal base; in aqua. Here are a couple others that I’ve done in the past. 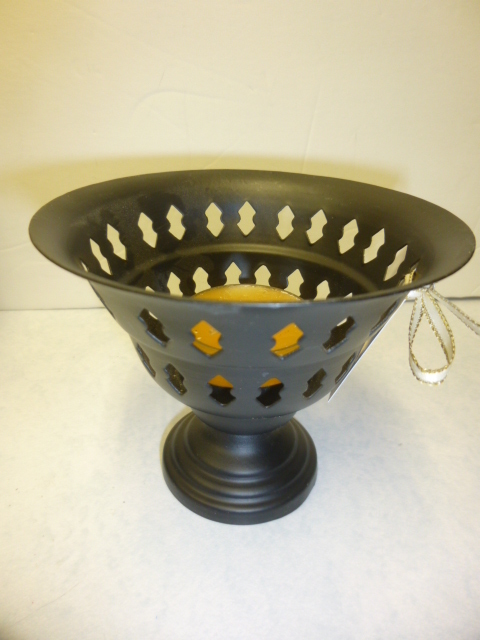 The wire baskets come in black so previously I had made the whole thing black. The bases on these are a vintage cherub candy dish; glued to a charger plate and spray painted. I did one in white also. Here are the components, before. Plus any kind of finial to use as your knob on top. It’s easier to attach your knob/finial if it has a screw in the base. You just have to find a nut to fit the screw to hold it in place. I’ve also made wire cloches out of old lamp shad frames with the fabric removed. But back to the present and the newest cloche and pedestal! I used a thrifted big candle pedestal for the base. Attached a round wood piece that I had on hand for the table part. I decided that I wanted this one to be aqua. The wood round needed a black basecoat first. 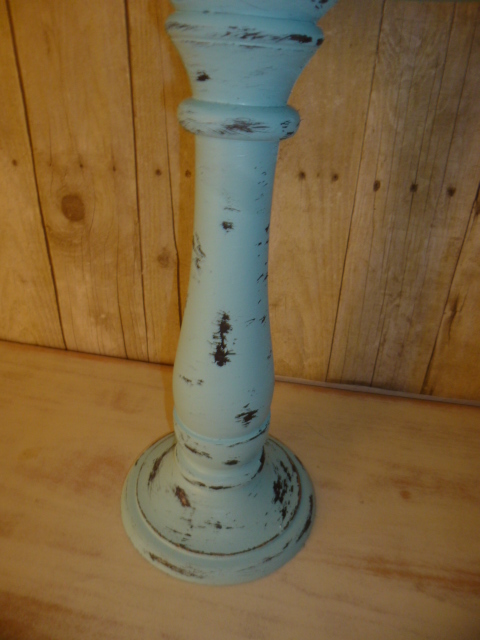 Glued it to the candle base, then painted both aqua and distressed. I wanted to wire cloche to be aqua too, but I didn’t want to spray paint the base. Plus, the aqua spray paint doesn’t match my brush on paint. So I decided to see if I could ‘dry brush paint’ the wire basket. It worked great. And now I have an aqua one to add to my repertoire! I started with the tall plain white prayer candles from Dollar Tree. You CAN buy them lots of other places, but not for just $1.00. And the more expensive ones are EXACTLY the same. They are ALL filled with plain old boring white paraffin wax. And they are always only filled to 2-3 inches below the top AND always have lots of extra wick! WHY are those last 2 facts important??? Because you can add some of your YUMMY smelling melted candle was to the TOP of them. Just leave 1/4″ of the wick, and be sure your wick stays in the center. Also BECAUSE you are only ‘topping off’ with the scented wax, you want to be sure your decorative paper covers ALL the way around so the ugly wax line doesn’t show. 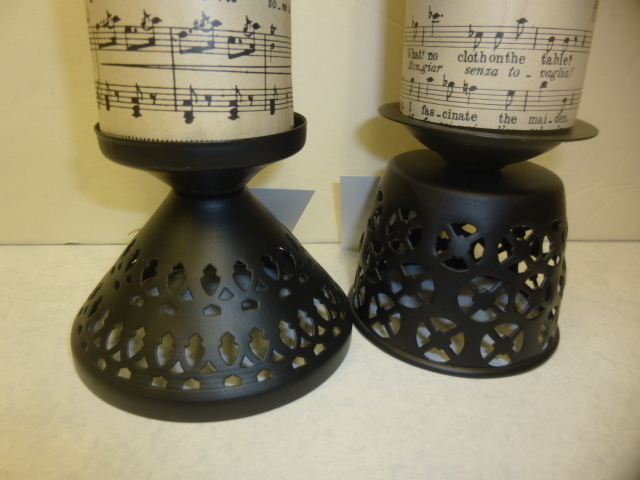 I took these black tea light holders (turned upside down!) and used them as bases to put my candles on! Feeling pretty darn clever for thinking of that one! This is how the tea light holders are supposed to be used! These will be headed to Stars soon, along with that batch of black finials I showed you a while back.